What’s better than chocolate chip cookies? 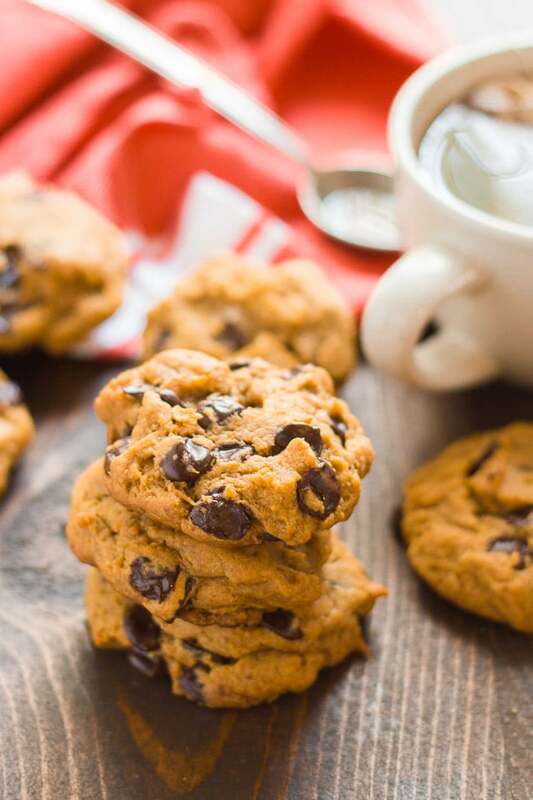 PUMPKIN chocolate chip cookies! Pumpkin puree and spices add amazing flavor and give the vegan cookies the perfect fluffy texture. Do you have a friend that shows up at Halloween parties wearing a “This is My Halloween Costume” shirt? Oh, maybe you are that friend. Apologies. It’s okay though, because apparently so am I. This is my Halloween post. Isn’t it terrifying?! My intentions were good. See, originally I thought I’d do this. I’d make pumpkin chocolate chip cookies that looked like they were infested with spiders. Very Halloweeny. I ran into some trouble though. I consider myself to be reasonably skilled in the visual arts, but I could not, for the life of me, create a spider. I got a crab, at best. I considered waiting until the sun entered cancer to post these, but really, who wants a pumpkin cookie in July? So here they are. Here it is. My Halloween post. Despite their unthreatening appearance, you’re probably going to want to make these cookies. They’ve got a lot going for them. First, pumpkin. I suspect that will be enough for a few of you, but I should also throw in there that pumpkin works extremely well in chocolate chip cookies, and especially so in vegan cookies, since it’s a natural egg substitute. These turned out incredibly moist and fluffy, and I attribute that to pumpkin. Moist and fluffy as they are, you might be surprised that I cut back on the oil, just a little though (I’d normally go for a cup), and I wasn’t trying to healthy them up, it just happened that I didn’t need as much. I attribute that to pumpkin as well. Then, I went and used a different type of oil. I usually use straight up vegan butter in cookies, but I tend to get questions about substitutions from folks who (understandably) aren’t down with palm oil or hydrogenation. I took a shot at coconut oil, and it worked! It better than worked, it made these cookies awesome. These might just be the best batch of chocolate chip cookies I’ve ever made, and I know how to make a mighty fine vegan chocolate chip cookie. 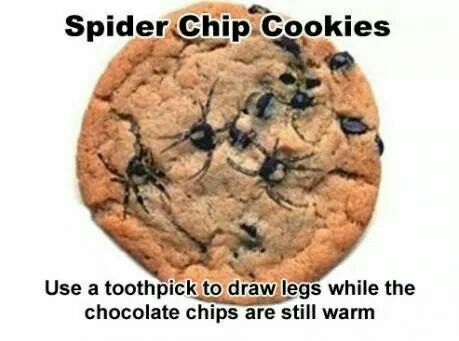 So whether or not you’re able to get some spidery legs going on, you should make these for Halloween, assuming you don’t fear the prospect of eating a whole batch of cookies at once. To make these scrumptious vegan pumpkin cookies, start by mixing your dry ingredients and wet ingredients in separate bowls, combine the two mixtures (don’t overmix!) and fold in your chocolate chips. Chill the dough for 30 minutes. Scoop rounded dollops of the dough onto a baking sheet and bake for 10 minutes. Let them cool a bit, and you’re ready for some spooky fun! Can you skip the step of chilling the dough? Yes, but it helps the cookies to bake up nice and fluffy. 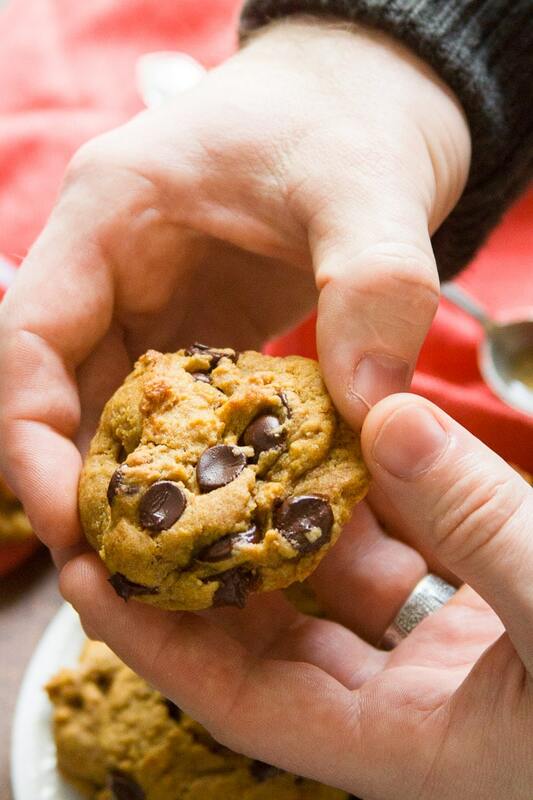 If you’re okay with flat-ish cookies, then go for it. Can you chill the dough for longer that 30 minutes? Also yes, but you might need to let it sit out for a few minutes to soften up. You want it to be a bit firmer than when you first mix it up — not rock solid. Enjoy Life is the brand of vegan chocolate chips I normally use, but there are a few others out there. You can usually find them at places like whole foods, and always online. As always, feel free to experiment with different stir-ins. Nuts, seeds, and raisins would all work well. Keep in mind though that these cookies are heavy on the chips, so you might need to cut back on those to get all your goodies in. Why does the recipe call for organic sugar? In the U.S., most granulated sugar is processed using animal bone char, so it’s not considered vegan. Organic sugar is processed differently, so it’s generally vegan. What's better than chocolate chip cookies? 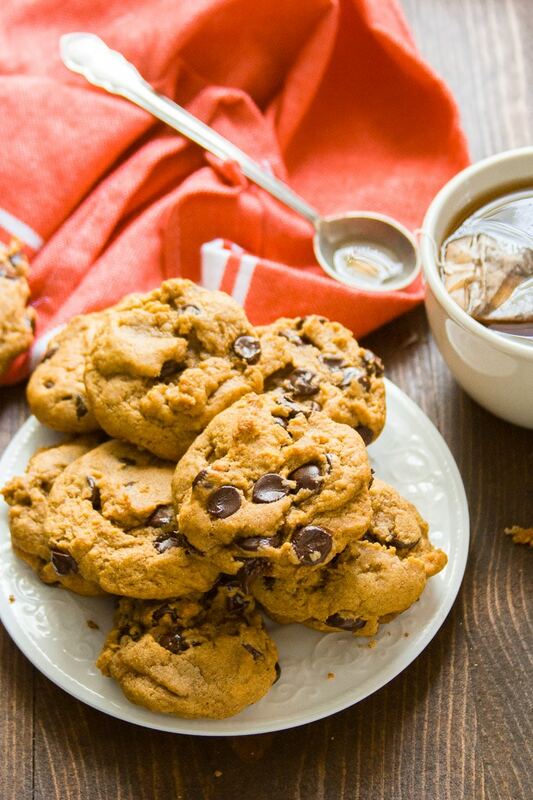 PUMPKIN chocolate chip cookies! Pumpkin puree and spices add amazing flavor and give the vegan cookies the perfect fluffy texture. 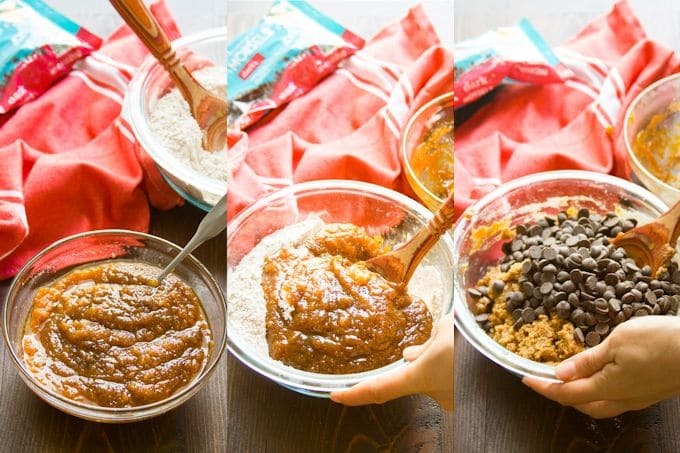 In a medium mixing bowl, stir together the flour, cinnamon or pumpkin pie spice, baking soda, and salt. In a separate medium mixing bowl, stir together the coconut oil, pumpkin puree, sugars, and vanilla extract. Add the pumpkin mixture to the flour mixture. Stir just until completely blended, and then fold in the chocolate chips. Cover the bowl and chill the mixture for 30 minutes. Drop rounded 2 tablespoonfuls of the dough onto the baking sheets. Bake for 10 to 12 minutes. Transfer the baking sheets to cooling racks and allow the cookies to cool a bit before removing them from the baking sheets. Yummm! I think you’ve just convinced me to try pumpkin and chocolate together. I love pumpkin cookies (pumpkin snickerdoodles are the bomb!) but haven’t tried chocolate chips yet. I made a batch of banana walnut chocolate chunk cookies last night (had a brown banana situation on my hands) which are safely stashed away in the freezer now. But I’ve got a Halloween party on Friday, so this may be the perfect thing to take along. Thanks for another great recipe! 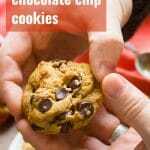 I just made these cookies and they are to die, thank you so much for this recipe! Awesome!! You’re so welcome – and thank you so much for commenting to let me know! I just made these cookies. Instead of both of the sugars I used agave, maple sugar, and sucanat. The flavor was amazing, but the texture was off. They turned out more like cake. They ended up just looking really greasy and puffy once I stored them. I was looking more for that cookie texture where its not too crunchy and kinda soft. Do you think I messed up by adding agave or are the cookies supposed to be soft and caky? Just made these and they are really delicious! The pumpkin gives the cookie moisture and the the outside is a nice thin crispy texture. Thank you for a great vegan cookie. Thanks Leslie! Glad you like them!! Can I sub a grape seed or olive oil for the coconut oil? I love had hard cookies will they get hard if you bake them longer. They’re not really cakey, but they’re also not crispy on the outside. They’re more soft and chewy. I think applesauce would be your best bet as an oil substitute, but I haven’t tried it so I’m not certain it will work. Do you have an oil free option? I’m afraid I don’t! Applesauce might work as an oil substitute, but I haven’t tried so I’m not sure it will work. 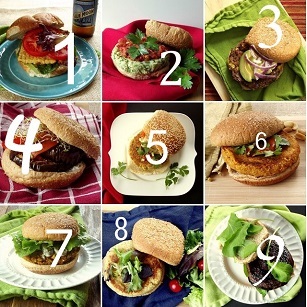 Could you do these without pumpkin puree to make plainer cookies or use a different flavouring? I only ask as I live in the UK where I would need to get pumpkin puree imported, but really want to make some vegan friendly cookies for work. Hi. Can I use gluten free flour in this recipe? I think an all-purpose gluten-free blend should work, but I can’t be sure since I haven’t tried! 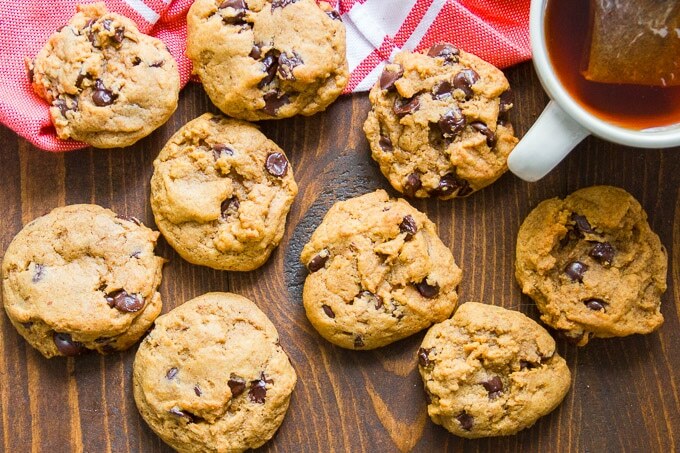 Amazing, delicious, and chewy cookies. Love em! Awesome!! I’m glad you like them!